DeHappy Restaurant on Macalister Road is now offering a menu which is both pork-free and alcohol-free and which provides more seafood choices. Gibson was here with friends for a year end luncheon, and discovered this restaurant’s famous dim sum style Teochew porridge as well as some of seafood in town. As you can see the crab claw is even bigger than the spoon. DeHappy Restaurant offers wild crab caught in Indonesian waters which is meaty and juicy. On the downside, the crab meat tends to stick to the shell in some part of the crab. We ordered Sautéed Crab with Cheese and for this big plateful, adequate for eight people, we paid RM208. Quite reasonable for this dish in the festive season. The portion size of the salmon provided for Loh Sang which Gibson sampled was generous especially when compared to some Japanese restaurants in town with significantly less. Gibson like the sweetest and aroma of the fish without the smell of the sea. However, we paid RM131 for this soup. Delicious is expensive too. When this dish was served we were all impressed to see the number of scallops which, as you can see, almost covered the plate. The chicken marinated with the coffee made the meat juicy and gave it a pleasing flavor. When Lotus root, Celery, Pea and Dried Shrimp come together, you know this is a very “biteful” dish. 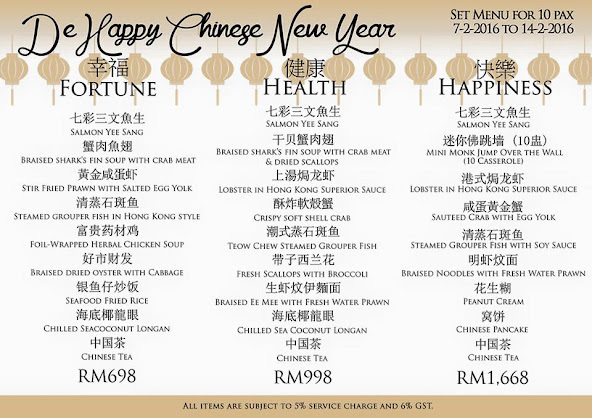 The restaurant opens as usual during Chinese new year They also offer 3 different set menus during the festive season. Business Hours: Please refer to update below. 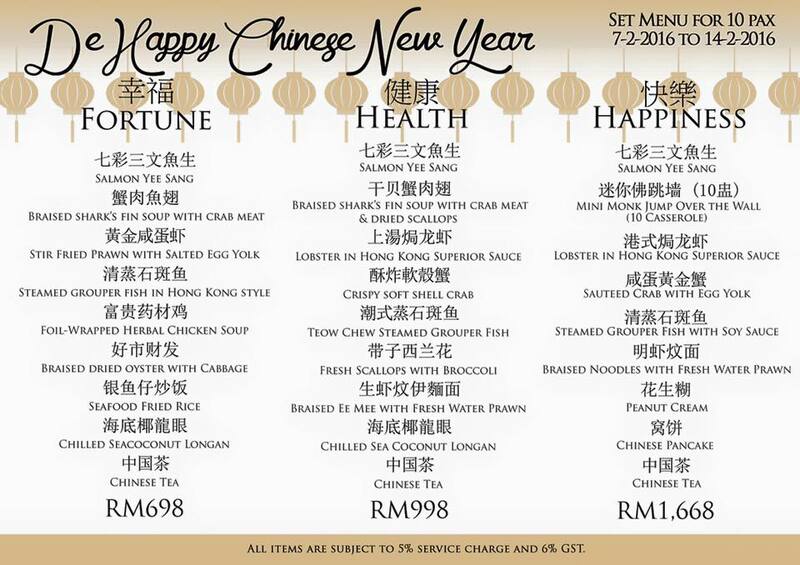 9am – 12am Daily, dim sum style Teochew porridge is available from 9.30pm - 3am. The price list presented here is as on 5th February, the day when I visited the restaurant, they do charge 6% GST and 5% service charge.